For starters, I have never been one to take big risks. I would describe myself as someone who has an adventurous spirit but lives cautiously. Most of my life I have been the girl who follows the rules and does what is expected. I dream big but usually stick with what I know inside my safe, cozy, comfort zone. I was born and raised in a small town in Indiana (cue the John Mellencamp music). I have lived in this same town my entire life with the exception of the four years I was away at college. Even then, I was only a few hours from home. Like many millennials, I moved back in with my parents after graduation and stayed well after I obtained my graduate degree from a local college. I eventually moved out of my parents’ house and into an apartment of my own, but not much else has changed. My graduate internship turned into my now job where I have been employed for the past seven years. I have a great life – supportive family, good friends, career of interest – all the things that make up a solid, stable foundation for life. But there is a part of me that feels like I am running in place… even though it’s good, I am not actually going anywhere. Both of my parents are avid backpackers and have been tackling sections of the Appalachian Trail piece by piece. They took me on my first backpacking trip in the Smoky Mountains in 2013. It was tough. It was dirty. I was exhausted yet I was enchanted! Returning home from that trip I started to read, research, and devour as much as I could about the Appalachian Trail. 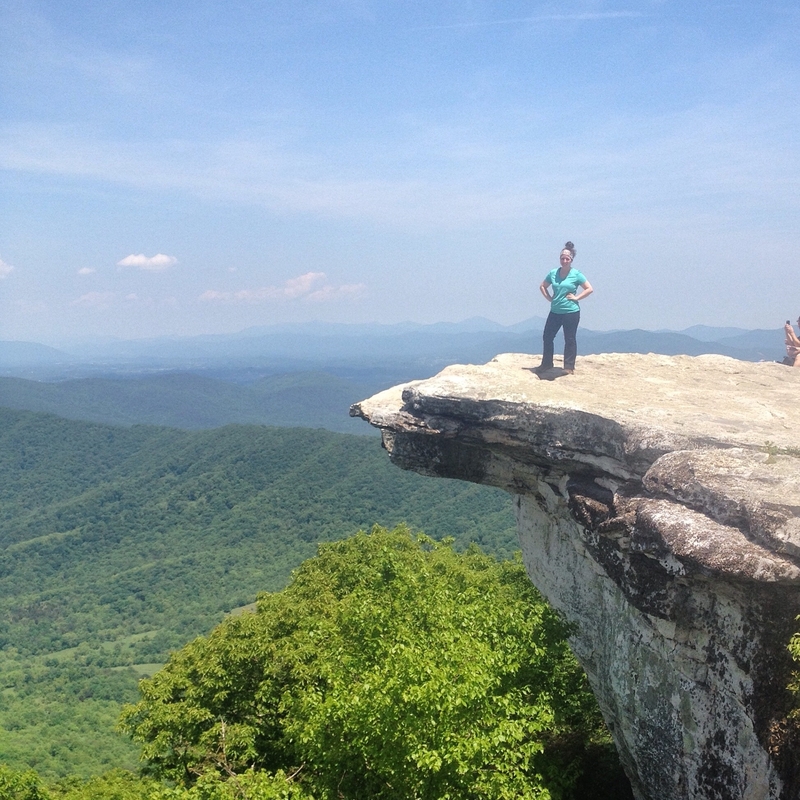 In 2014, I hiked the triple crown of Virginia (Dragon’s Tooth, McAfee Knob, and Tinker Cliffs) with my dad. I was nearly star-struck when I stopped for lunch at a shelter only to find one of the many hikers I was following via Instagram at the same location. The encounter was a reality check for me – behind the screen and postcard-perfect posts was a real person crushing miles and conquering mountains day after day. This person was doing the thing I considered nothing more than a fantasy bucket-list item. Shortly after that trip I created a 30 by 30 bucket list (cringeworthy and cliche, I know). Predictably, one of the items was hike the Appalachian Trail. I once shared this list with someone I was casually dating and was surprised by his response. I was told I was naive and irresponsible to even consider hiking solo as a woman. He later used this as a reason to stop seeing one another because he “wouldn’t just wait around for six months.” Fast-forward a year to when I am having a conversation with a close friend. Knowing my timid nature, my friend asked what is something I have always wanted to do but was too scared to try. Again, I shared the dream of thru-hiking the AT. This time I was met with a much different response. Instead of condemning me or giving me reasons it was unattainable, I was met with excitement and questions about what it would take to check this off my bucket list. Kind of like the Grinch whose heart grew three sizes on Christmas day, that spark inside of me to see more and do more grew a little brighter. I started to imagine that it was possible and hiking the AT could be more than an unfulfilled item on a list of dreams. For years, I was content reading blogs, books, and following the journeys of others. Living vicariously through their adventure was enough… until one day when I realized it was not. With much enthusiasm, a healthy dose of anxiety, and pure determination, I declared my intentions to hike the Appalachian Trail in 2018. WoooHooo! I am so excited for you, I’m smiling ear to ear!!! Get it girl!! Also, never forget what Backcountry taught us ?? Pure joy and excitement as I can’t wait to read the next step! You got this! Good read! I am a little biased, being a Hoosier as well, a somewhat similar story, and deciding to take on the AT this year as well. It really has taken on a new life going from reading and watching people plan for years, to actually doing it yourself. Best of luck to you! Class of 18!! Adam, are you writing for the Trek or vlogging your trip? Best of luck! No, not writing for the trek. I have a YouTube account I am attempting to try out, but it’s not coming together really well right now. Instagram, adam_wandering, is my go to for now. It would be great to have ya along! YES! I am determined 2018 will be the best year yet. Counting down the days until I step foot on the trail. Good luck & happy hiking! I can’t wait to follow along. My Mom tells me you are amazing, and she knows people. Good luck! Wonderful and so true. Your post reminds me of a time when I was in my mid-30’s, single in Cincinnati, when two of my co-workers sent my picture to a statewide dating site. I got a call from a guy from Columbus the night before I was scheduled to leave for a 10-day backpacking trip in the Grand Tetons. I explained to him what I was about to do and he was – in essence – speechless. It was quite clear that his idea of an ideal woman was NOT someone who would be sleeping outside and relieving herself in the woods. So glad that got nipped in the bud. My husband of 18 years will not be hiking with me (bad knees) but is 100 percent supportive of and excited by my planned journey. This surprises me coming from you! I had no idea you were interested in hiking!! Good luck, I’ll be cheering you on and following along!